The Legend of Zelda: Breath of the Wild’s first DLC pack offers new armor, challenges, and features, plus a whole new mode of play. Keep reading to see what we think of every aspect of DLC Pack 1! Trial of the Sword is a serious challenge designed to test your resourcefulness, stealth, and combat skills. 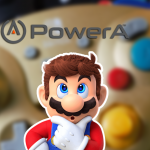 If you’re successful, you’ll be rewarded with a powered-up Master Sword! Trial of the Sword is broken into three stages—Beginning, Middle, and Final Trials—and each stage contains a number of rooms. When you begin the Trial, you’ll be stripped of all your gear, belongings, and Champion Abilities, but your hearts, stamina, runes, and inventory space will remain. As you move through the rooms, you’ll collect supplies that will help you heal and defeat enemies. This is crucial, since you lose if you die (and you don’t have Mipha’s Grace to save you!) and you must defeat every enemy in one room to proceed to the next. 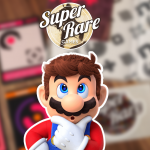 If you’re lucky, you may be able to snag a few fairies, but they’ll only get you so far! You’ll still have your hearts, stamina, runes, and inventory slots—but that’s it! Here’s a peek into what you’ll face in Trial of the Sword. After beating one stage of Trials, you can attempt the next stage at your own pace, and you can revisit easier stages for extra practice! After beating the second stage, your Master Sword will be powered up to 50, and after beating the third and final stage, it will be powered up to 60. Of course, your Master Sword will still run out of power periodically and need to recharge, and some players may find this disappointing. But I think it’s a necessary feature. After all, if your Master Sword never needed a recharge, you’d never need another weapon again—and where’s the fun in that? Sometimes, you’ll be fighting in the dark in Trial of the Sword. Good luck! You can play Trial of the Sword in both Normal and Master Modes, but I recommend trying it in Normal Mode first. 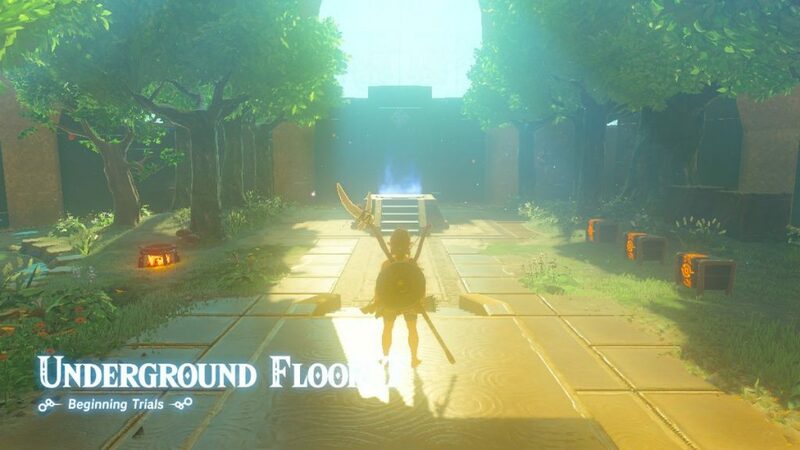 If the Trial is way too hard for you in Normal Mode, you should spend some time practicing your combat skills around Hyrule in Normal and/or Master Mode. But if the Trial is way too easy for you in Normal mode, try it in Master Mode instead! Trial of the Sword gives you a little break every once in a while in the form of this sunny room, where you can collect supplies and cook! 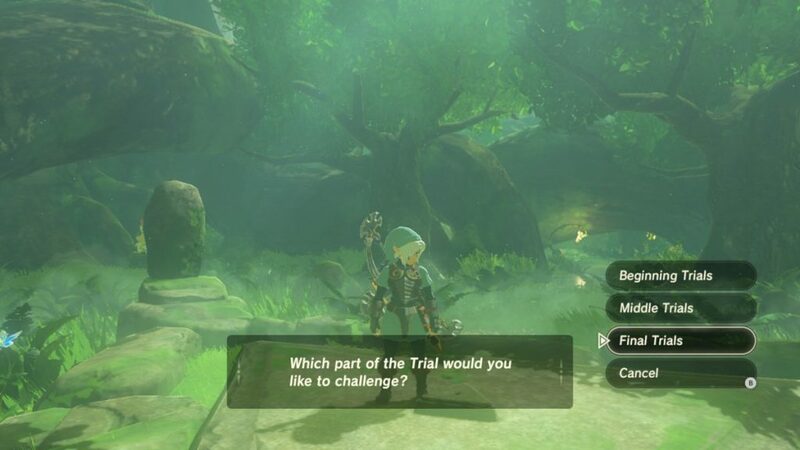 Overall, Trial of the Sword adds an exciting challenge to an already-challenging game, and the reward—the fully powered-up Master Sword—is, in my opinion, well-worth the effort. Plus, Trial of the Sword offers a breath of fresh air for those players who need a break from running around Hyrule and gives players of all skill levels a chance to focus on improving their resourcefulness, stealth, and battle skills. 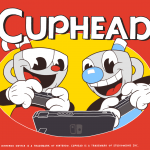 This whole new mode of play offers a fresh new start for those who have already beaten Normal Mode and are thirsty for more. 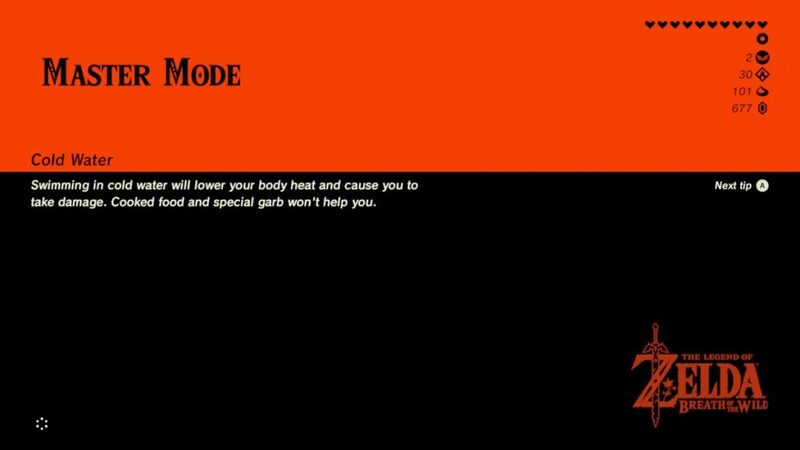 Master Mode is a whole new save file—but in this challenging mode, things are a lot more difficult for Link. 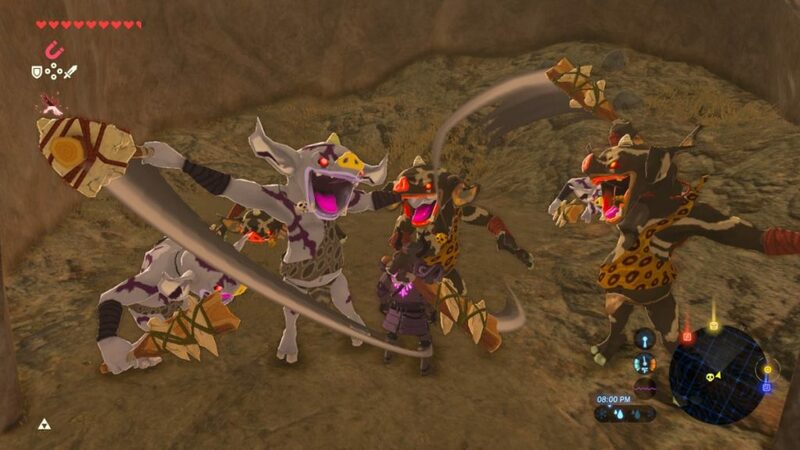 For one thing, all enemies are “leveled-up”: Red Bokoblins are Blue, Blue Bokoblins are Brown, Brown ones are Silver, and Silver ones are—GOLD! That’s right; any enemy that was Silver in Normal Mode is GOLD in Master Mode! Also, enemies regain health when Link isn’t busy damaging them, so kill them quickly if you plan to kill them at all. Even the loading screen is terrifying in Master Mode! 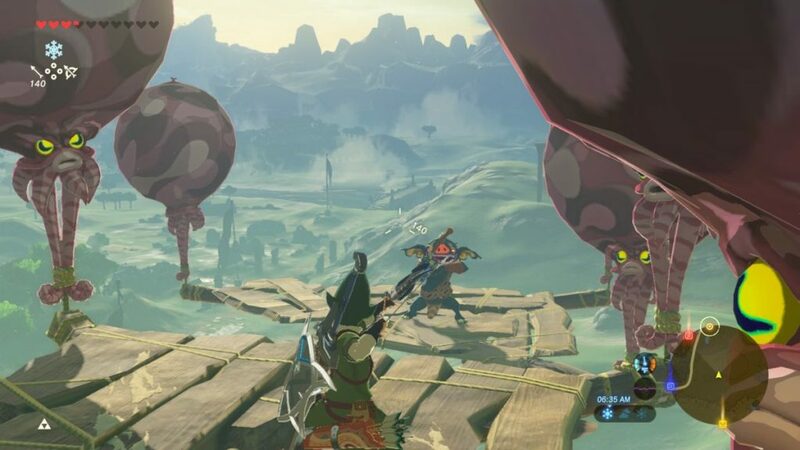 Master Mode also features a new addition to the Hyrulian landscape: wooden platforms carrying enemies and/or treasure held afloat by Sky Octorocks, a new breed of enemy. You can take down these Octorocks if you like, but if you’re not careful, they might drop your treasure, and you might not get it back. The chests on these platforms often contain killer items, so it’s worth your time and efforts to get them in any way you can! Fighting in the sky! No treasure chest here, but this is still pretty fun regardless. 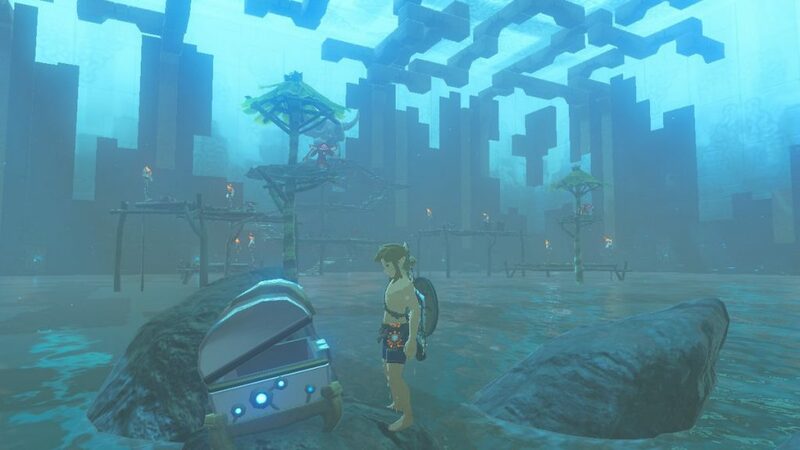 Master Mode is great for anyone who wants to play BotW again and be especially challenged. I love that this mode adds fresh new elements, like the floating platforms and the Gold enemies, but I also enjoy the powered-up enemies, even if I’m a bit too scared to take them on at the moment. With Master Mode, there’s always a challenging enemy to take on—and if you’re not up for a fight, you can always hide behind Majora’s Mask! 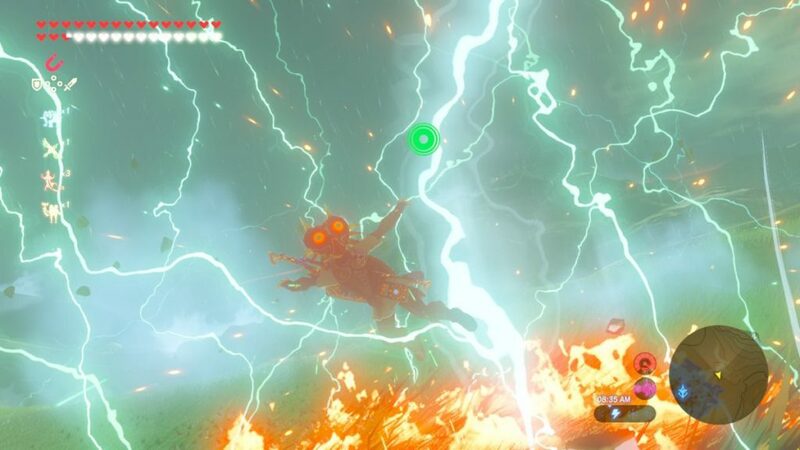 A typical fight in Master Mode. Keep in mind that I just started this file last week and have only defeated a handful of enemies and am already being bombarded by Browns and Silvers. 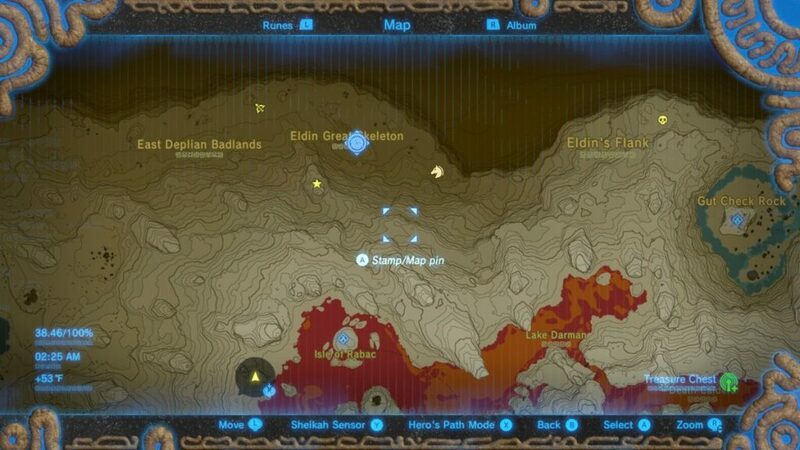 Another great new feature is the Travel Medallion, which is hidden in an EX chest in Hyrule and comes with its own side quest to help you find it. This nifty item lets you place a warp point anywhere you like on the Hyrule map! For now, I’ve placed mine at the Eldin Great Skeleton, since that particular area is nowhere near any easy warp points. You only get one Travel Medallion, but you can move it around as you like. I’ve placed my Travel Medallion at the Eldin Great Skeleton. Pretty good place for it, eh? 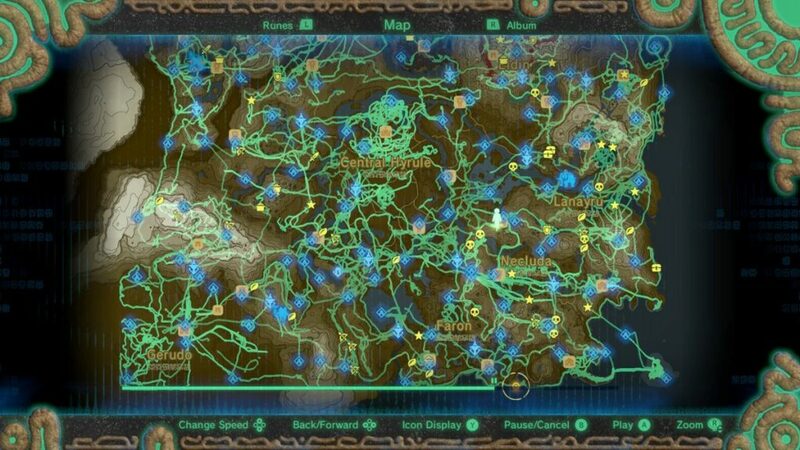 This new feature lets you track your entire journey through the land of Hyrule. If you started playing BotW before DLC Pack 1 was released, you still get to use this cool feature, since the game has been tracking your progress all this time! I hear that it tracks your previous 200 hours of play, but I had logged over 220 hours when I first launched my Hero Map, and it still tracked everything I’d ever done. But in any case, Hero’s Map Mode lets you view your play history, which is super helpful if you want to visit every nook and cranny of this game’s vast world. My Hero’s Map. Even after 220+ hours of play, there are still many spots that I’ve missed! You can view your entire journey at once, or you can “watch” yourself move through the game while Hero’s Map animates the history of your path for you. While Hero’s Map lets you choose the speed at which this animation moves, I wish it would let you choose a faster speed, since even the fastest speed is pretty slow. If I were to watch all of my progress in this game at the fastest speed available, it would probably take at least an hour, if not two or three, and I find that disappointing. But overall, the fact that you can clearly see where you have and haven’t been makes this piece of DLC well worth it, even if you can’t watch your journey play out on the map at a reasonable speed. 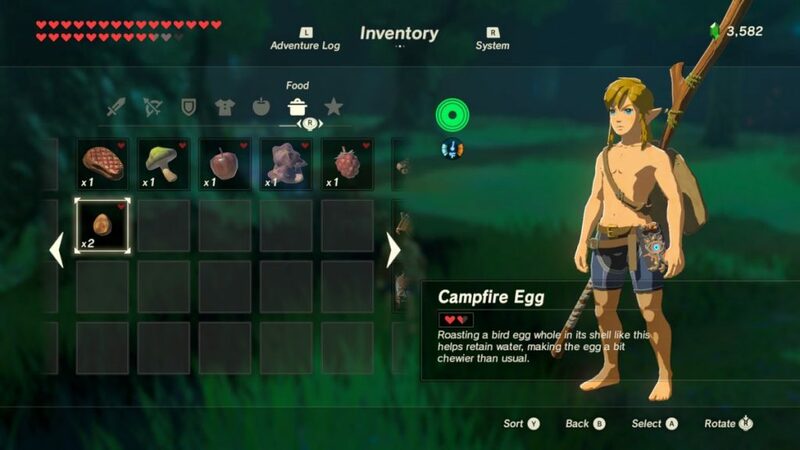 The DLC also unlocks new armor, which is hidden around Hyrule in EX chests. But the game helps you find these chests, treating your quest for each new set of armor as a new side quest. Some of the new armor is pretty gimmicky, but most of it is quite useful, especially if you’re starting a new file in Normal or Master Mode. However, none of the new armor is upgradable, which is really kind of a bummer. Keep reading to learn more about the new armor from DLC Pack 1! 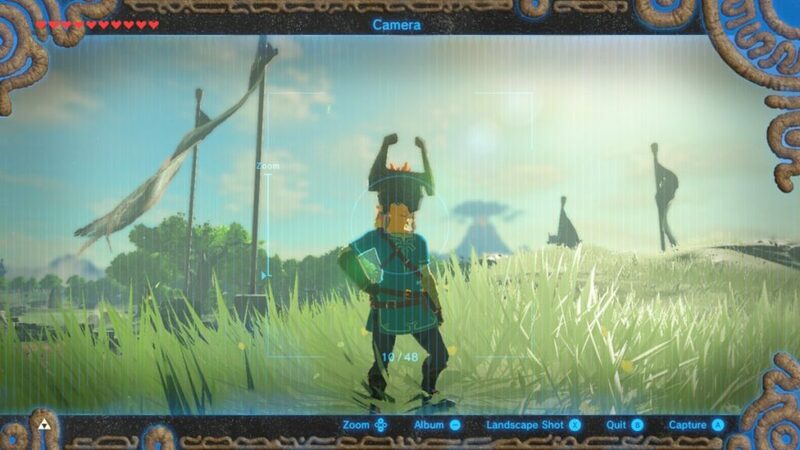 This handy mask shakes and gives off sparks when you’re near a Korok seed, which makes tracking down all 900 seeds a whole lot easier! But if you aren’t familiar with the various spots where Korok seeds are usually hidden, you’ll still likely have some trouble finding them, so it’s best to familiarize yourself with the usual hiding spots before relying too much on the Korok mask in your hunt for those tricky seeds. 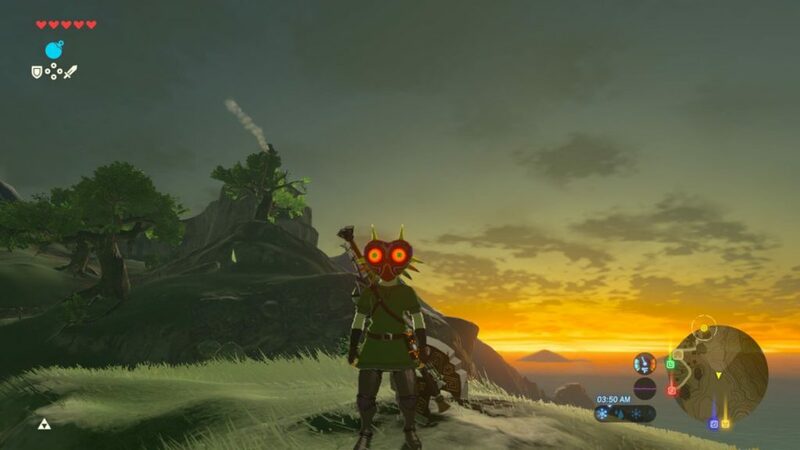 The Korok Mask shakes, sparks, and makes noise when you’re near a Korok Seed. The little windmill spins, too! This mask lets you blend in with enemies—so long as you don’t take violent action against them! Of course, there are other masks in BotW that have this same effect, but they take a good deal of time and effort to acquire, and they don’t work on all enemies at once. Majora’s Mask is different: it makes you look supremely evil, so you blend in seamlessly with almost every enemy in the game! The only enemies this mask doesn’t fool are Guardians and bigger bosses, like Ganon. Majora’s Mask lets you blend in with all enemies—except for Guardians and big bosses! This cool new helmet, designed after Midna’s Helmet in Twilight Princess, offers a fair amount of defense while giving the added bonus of Guardian Resist Up. 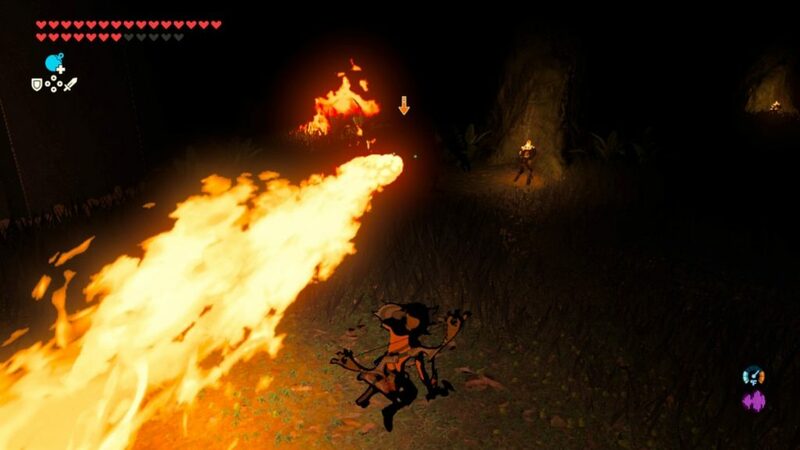 This is especially useful early in the game, when Guardians are still terrifying creatures that are nearly impossible to beat if you’re not adequately prepared—and, like Majora’s Mask, Midna’s Helmet is pretty easy to find no matter where you are in your file. Midna’s Helmet gives you Guardian Resist Up! This new set, inspired by the Phantom Hourglass games, offers 24 points of defense when worn as a complete outfit. Additionally, each individual piece boosts your attack power, even when you don’t wear all the pieces at once. Like Majora’s Mask and Midna’s Helmet, the Phantom Set is easy to find when you begin your game, so this new armor can give you a real boost if you’re starting a new file in Normal or Master Mode. Plus, the Phantom Set makes you look awesome! The Phantom Set makes you look awesome and gives you a great boost in the game’s early stages. 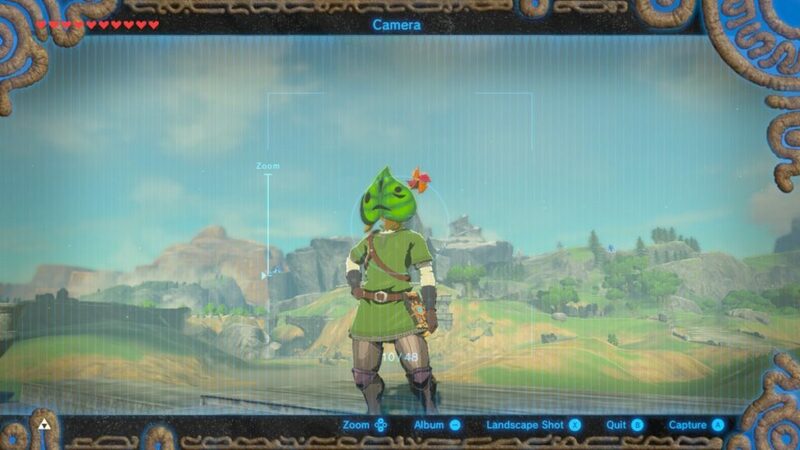 While the Tingle outfit boosts your night speed when you wear the whole set, it doesn’t offer a lot else aside from making you look like Tingle. 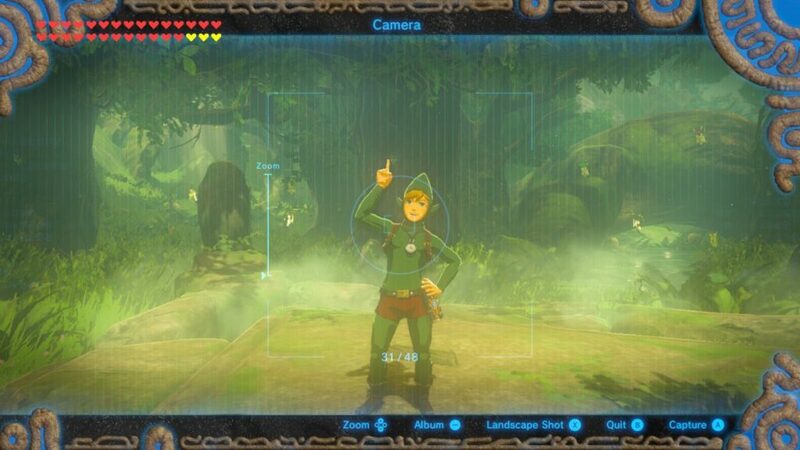 If you love the guy, then you’ll probably love this armor—but if you aren’t a Tingle fan, you probably won’t like it too much. Tingle Set, which boosts your speed at night. Overall, I am thrilled with the new armor in DLC Pack 1, and I think you will be, too. But it’s important to note that much of this armor isn’t very useful in Normal Mode if you’ve already made significant progress in your file. 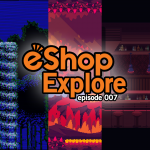 And, while most of this armor is helpful when you start a fresh file in Normal or Hard Mode, that helpfulness dwindles significantly as you progress through the game and acquire better armor. But even if some of your DLC Pack 1 armor loses its cutting edge at some point in the game, it still makes you look really cool! 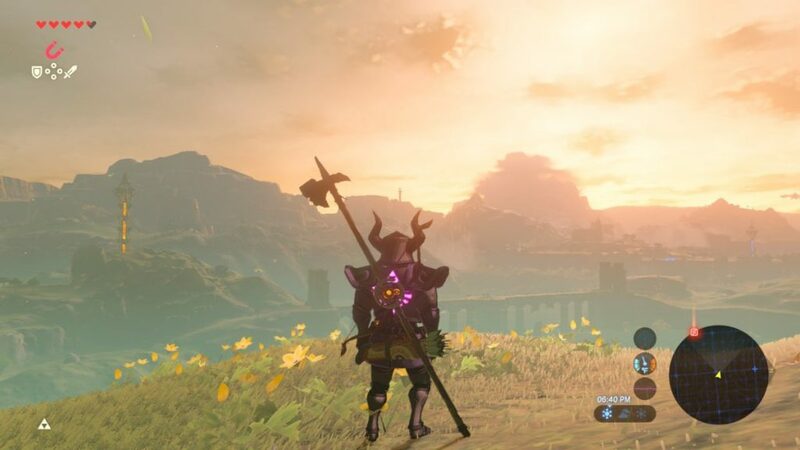 BotW’s DLC Pack 1 is a dream come true for any dedicated player who’s thirsty for more. 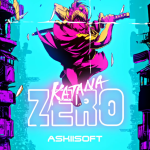 Of course, if you’ve already had your fill of BotW and are ready to move on to something new, you might want to hold off on downloading this DLC for now. But if you’re eager for more Hyrule fun, I recommend that you download this as soon as possible. At $19.99, it’s an unbelievable value for all that it adds to the game, and I cannot wait to find out what Pack 2 has in store! 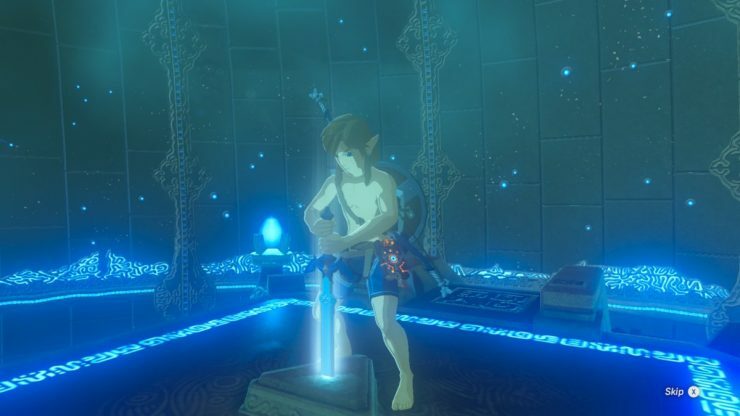 Are you ready for the challenges you’ll face in Master Mode? The Hero’s Path feature can go even faster if you max out the speed and have the map zoomed out. It apparently goes slower if you zoom in.